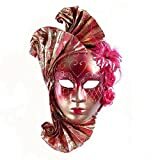 Red Venetian Masks On Sale! ✔Mask Material: plastic,High Quality Eco-friendly Resin,Cloths.Size: One Size Fits Most. ✔Hand made craft Materials for comfortable wear,Unique Venetian style with Colorful glitter detailing. 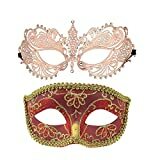 ✔Wearing this gorgeous mask will give a stunning and guaranteed to make you stand out at your masked ball. ✔The mask is finished with two black silk ribbon ties. There is a small hanging ribbon hidden at the top,so you can hung this beautiful Phantom Design Volto Mask on a wall as decoration or worn using black ribbon attached on each side of the face. 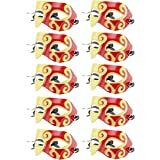 This New Music Mardi Gras Jester points are bendable, you may adjust to your liking. At the end of each point is a bell and a faux pearl. So elegant for your Party. 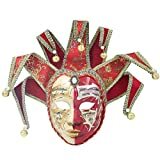 The mask is quite admirable with the classic details hand painted Celebrate carnivale,venice carnival,Italian culture,mardi gras parties and festivals in a creative fashion. NW: 250gThe seven angle Volto mask is a popular Venetian masquerade-inspired mask because the style is comfortable to wear. It is also called a Larva mask because it used to be mainly white in color, which can make a buyer appear ghost-like when wearing the design.